If you’re considering a pillar page approach, want to increase your search authority on a particular topic, or simply want to create a wider range of relevant content for your audience - topic clusters should be on your content agenda. So from this, we can see that topic clusters are an important supporting part of pillar page development - and are an important element within modern content strategies. So what exactly are topic clusters, and how can they be of benefit to your campaigns? Topic clusters consist of multiple pieces of interlinking content, which all outline an individual aspect or sub-topic within the same high-level topic (such as ‘What Is Account-Based Marketing’). This wider topic should be the focus of the pillar page - which itself should link back to each individual, related content item within your topic cluster. In this way, a topic cluster (a number of related, interlinking content items around a certain topic) works to support a pillar page. In addition, each individual topic cluster content item works as a stand-alone content item, about a particular sub-topic. 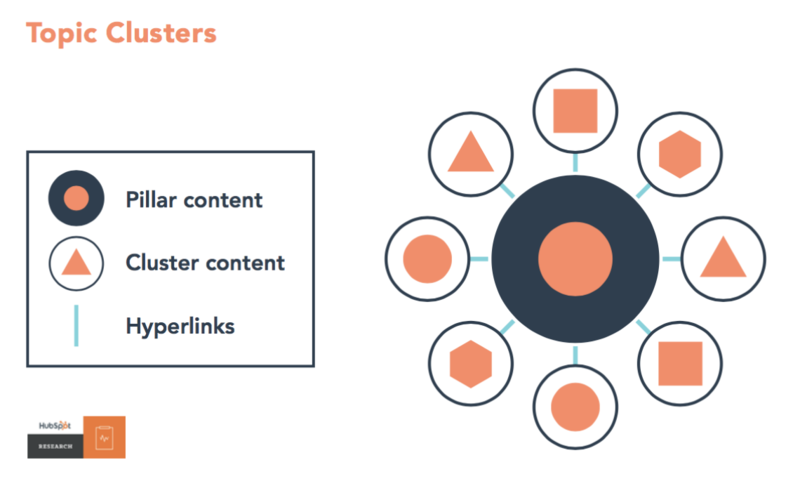 What Are the SEO Benefits of Topic Clusters - Why Include Them In Your Content Strategy? Doing this is beneficial for a number of reasons. Firstly, content that’s structured in this way, that interlinks and is optimised to include relevant topic keywords, will help search engines to recognise that you are the authority on that particular topic. This means your pillar content and related topic cluster content will rank better in search results, and draw greater, more relevant traffic volumes (and leads!). Secondly, as the topics and sub-topics you choose for your content should all address subjects relevant to your ideal buyer audience - helping them to solve a challenge they’re experiencing - this should leave you with a wide library of valuable content, that enhances your authority with your ideal customers, and also within search results. Keep in mind that you can create more than one topic hub too. You may want to create a range of pillar pages on different topics, and need a cluster of relevant content around each one. Considering your content strategy in this way can result in a diverse range of content, across a number of topics, that all has a positive impact! The topic cluster - your multiple pieces of interlinking content, that are related to that top level pillar topic (in the form of blogs, guides etc) - is there to dig deeper into specifics around the top-level topic. So, for a pillar page on Account-Based Marketing, we have supporting, detailed topic cluster content that delves into sub-topics such as account-based marketing tools, how to implement an account-based marketing plan, account-based marketing best practices and more. This means that a pillar page is much more than a long blog post. And topic clusters are more than just a few blogs on a similar topic. They support each other as part of a wider content and SEO strategy, designed to drive value and help your content be seen by the right people. Together, a pillar page and it’s related topic cluster content combine to give your pages a higher level of authority, and greater placement in search results to drive substantial, relevant traffic to your site. Before revamping your content strategy approach, it’s important to make sure that a pillar page and topic cluster approach will work for the topic that you want to focus on, and where you want to gain authority. Does the topic you want to rank for have enough search volume to justify the time and resource dedication required. In-depth keyword research is an important step prior to any content mapping or creation, to be sure that there’s interest and traffic behind your proposed topics. When considering potential pillar page topics it may help to start by identifying 5-10 core, top-level challenges that your clients and prospects have (that you solve). Then break these down into broad topic areas and base initial research around them. Is the topic in-depth enough to warrant the creation of a range of detailed topic cluster content, as well as a pillar page. A content audit may be a necessary consideration here; you may already have existing content that you can use within your topic cluster to support a pillar page. If the topic is relevant to your ideal, best-fit audience, and is something where you want to be considered as an authority. There’s no value in creating a large volume of content if it’s irrelevant to your audience! The goal here is to create lots of content that your customers and prospects want to see. Keep that in mind, and you’ll be off to a good start! If you use HubSpot, the HubSpot Content Strategy Tool is a great way to start mapping your topics and sub-topics, visualise the keyword strategy behind your content and keep all of your content aligned. With the right planning and consideration, topic clusters and pillar pages can form an integral part of your SEO & content strategy, and work hard together, to drive relevant traffic, enhance your search presence and grow your authority on the topics you care about.